DCR is direct conversion receiver, i.e. detection by hetrodyning a frequency at or very near the receiving signals frequency. Results in a direct audio conversion "mixer product". I picked up many valves on the broken TV-sets on the street about 30 years ago. I got many 12BH7A on them. 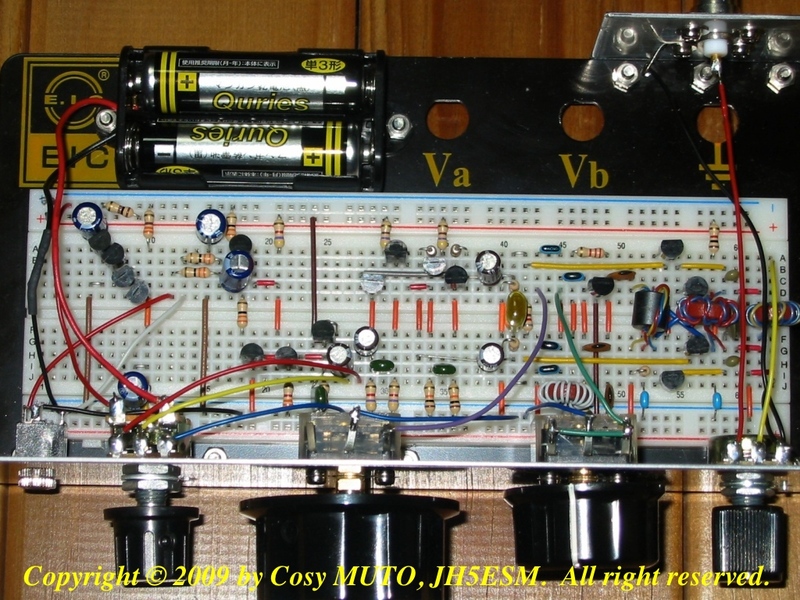 In these days (in the end of 1990's) I made a radio to receive 7MHz SSB and CW signal with these valves stocked. Sometimes I introduced on the Japanese CQ magazine that some vacuum tube can be used by 12VDC on its plate voltage. That of December 1992 I introduced pair of 6BM8; 7MHz super radio. I will show you two types of 7MHz radio. Both types are single conversion super heterodyne. This is the new 40 meter Receiver building project for the Western Belles, a YL group here in Southern Oregon. 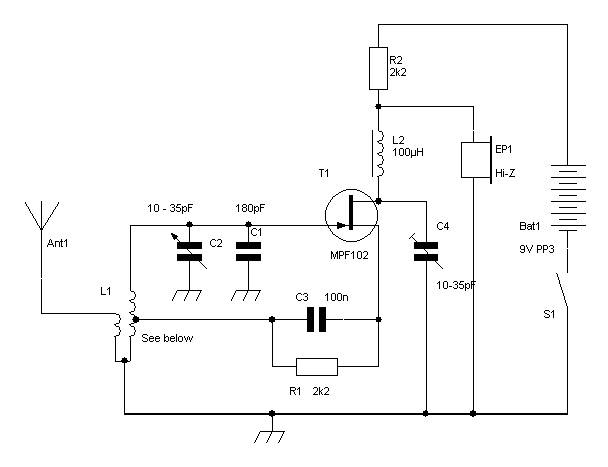 Building a practical and usable direct conversion receiver for the 40 m CW band is not as simple as it might appear. 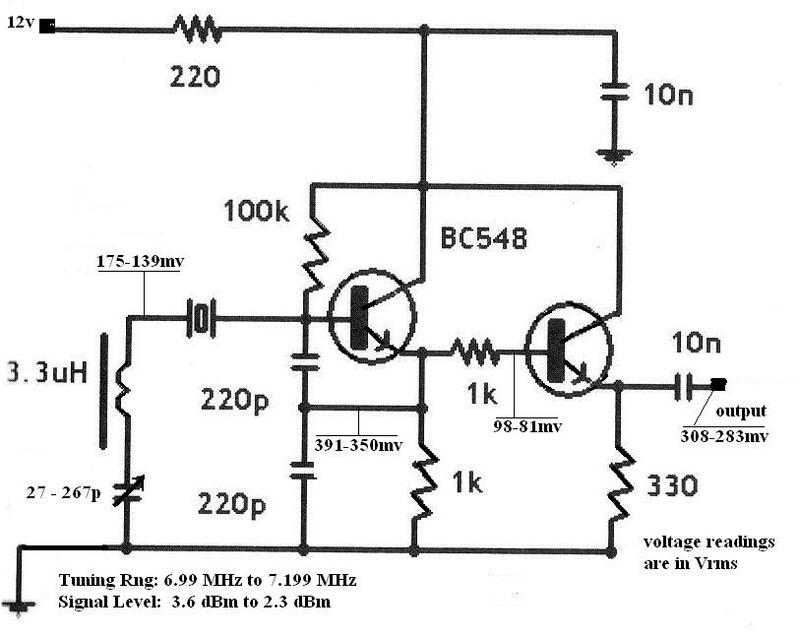 Broadcast station signals from the adjacent 41 m band, will easily overload most direct conversion mixer designs ..
Today it is very difficult or quite impossible to purchse components that are best suited for QRP circuits. Mixer ICs like the NE602/612, ceramic filters SFE7.02, RF power transistors up to 5W belong to this group. By the addition of one integrated circuit and some passive components, I was able to convert my earlier developed 40-meter direct conversion receiver design into a superhet model. The regen receiver is an amazing piece of electronics. 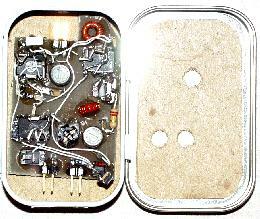 With the circuit shown the receiver can pull in SSB/CW stations well from all over Europe on 40m (or 80m) with ease. T1,T2, T3: 4uH with adjustable slug, 10mm square, shielded; pry off shield to wind coupling-link over grounded end. Headphones: 600 Ohm impedance or higher; change AF transformer (10k:500 Ohms), T4, to match phones used. 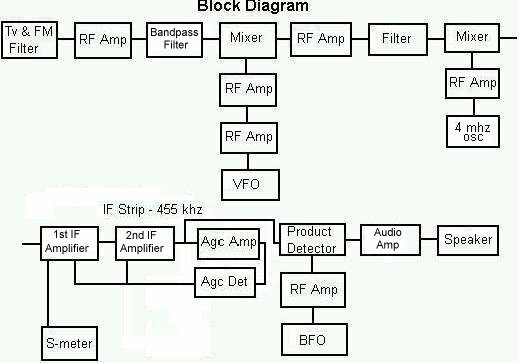 Reflex is defined as a construction of a receiver ,using one stage of wide band amplifier as a RF amplifier and an audio amplifier by setting a proper band pass filter input and out put of an amplifier. I made a 7MHz band monitor scope. It exchanges all existing signals of that timing of 7MHz-band to viewer image like a hill on the oscilloscope. One day on the second hand shop on my town, I found the FM tuner sold only with 10 dollars. That tuner was old type. The frequency display of it was not digital but made by a needle and a thread. I bout it and made SSB rcvr. I decided to build this receiver, having become totally disatisfied with the TS120 receivers performance on 7Mhz. 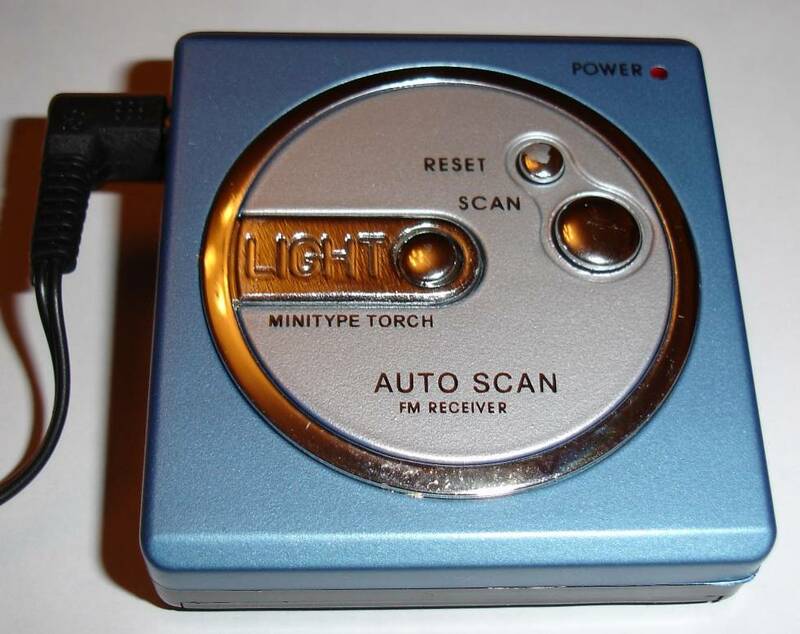 These days, they have hybrid-radio's named Mini-compo in every home. With this machine, you can hear 7MHz SSB signal by the MW-radio of mini-compo. Because MW-radio has no BFO, it cannot demodulate the ssb signal. Once upon a time, there was an FM IF subsystem IC called MC3357. The IF section of MC/NJM3357 consists of five stage cascaded differential amplifiers and thus it works as an IF limiter. 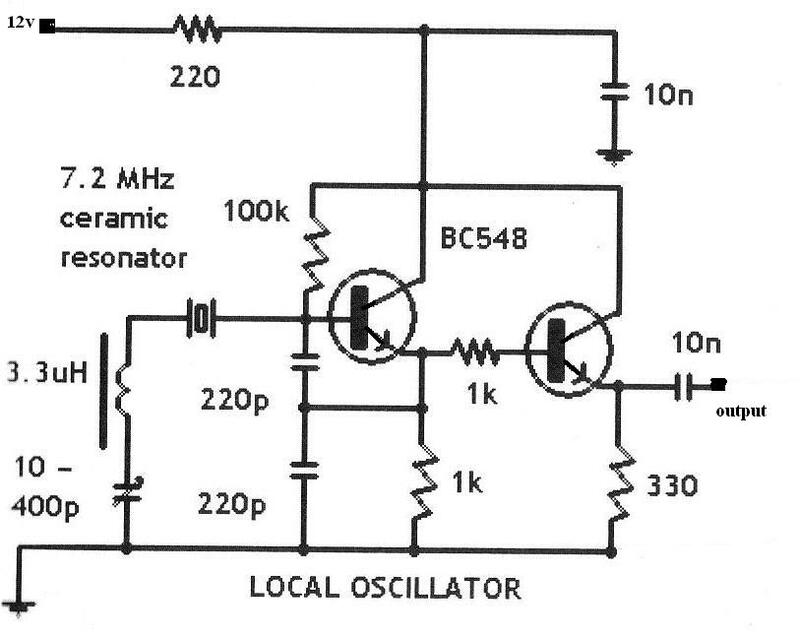 The objective of this page is to propose a CW receiver featuring AGC-less IF section. I've had a lot of fun with the modified WBR (Wheatstone Bridge Regenerative) receiver which I built Manhattan-style some years ago. 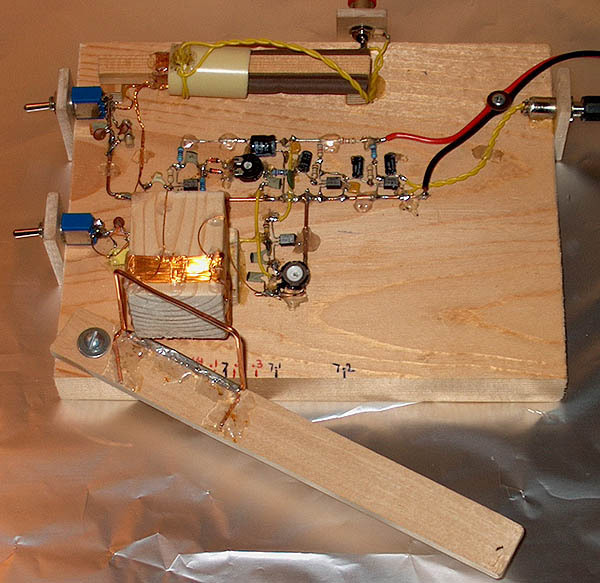 The design builds on the receiver described by Daniel Wissell, N1BYT in QST August 2001. Although it doesn't match a good superheterodyne, you get more performance per component than in any other receiver! Last year my cousin had to submit a class project towards her engineering degree and I suggested that a direct conversion receiver might be a good idea. This receiver is the result of that project. Der Empfänger ist trotz seiner gewollt spartanischen Ausführung signalfest und trennscharf. Der VFO ist abgesetzt, langzeitstabil und driftet bei sorgfältigem Aufbau ca. 100 Hz/h. I came across this very interesting design on the internet and decided to get on with the construction. The design is by VU2FAX OM Ashhar Farhan (Of the BITX fame :) ). About 20 years ago, 7400 series IC's began to used. Then I made small game with 2 switches and several LED's with 7400 series. In these days, 4000 series IC's is popular. Many of them are the copy of 7400 series. 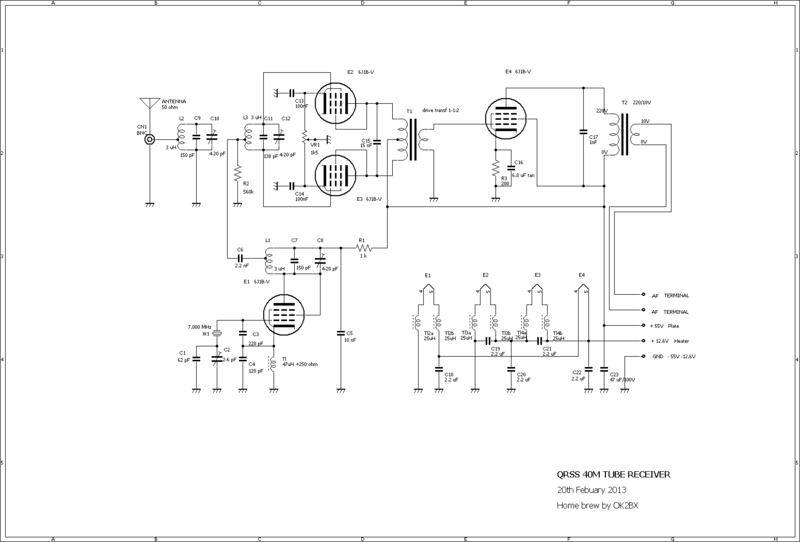 After building several types of receivers and study filters and impedance adaptors, we decided to publish the results. It is a direct conversion receiver, very simple, easy to mount, it does not need an etched pcb, it is not necessary to wind coils, the parts are available in our commerce or some of them can be obtained from scrounge and it has low cost. I woke up one day eager to build something simple (at least I thought is was simple) and opened up the first chapter in EMRFD and decided to build the 40m direct conversion receiver. 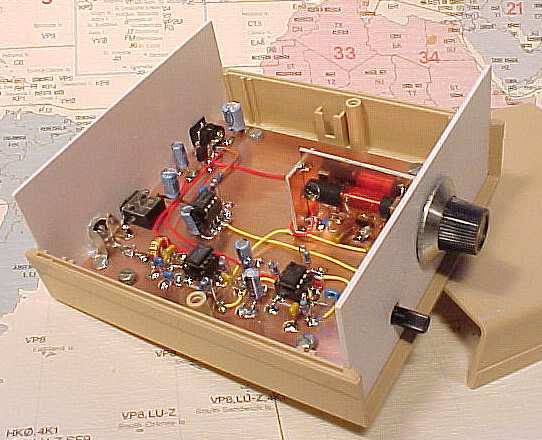 As here in Brazil the QRP transmitter construction was very extended, there was a hole for receivers. Our idea is the JABUCA can be used making line with other tramsmitter like the Alf, the Alfinete, the Carrapato, etc. In old days there are many "Japanese someting" in Japan. They are American culture translated to Japan. For example the singer who sings the song of Space battle ship Yamato was called as the Japanese Prethry. The LED MOSFET Receiver is considered a 'buildable' version of the "DX Receiver", which is another all MOSFET design, using a single balanced RF amplifier, a single balanced mixer, and a MOSFET 455kHz IF strip. 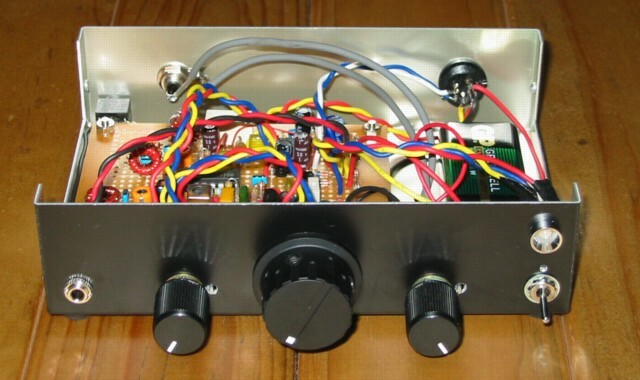 This is a single band solid state amateur band receiver project, meant for SWLs and new comers. The complete sections are on a single PCB and all components for this project are available in the local market. When my wife Carolyn showed up, sporting an Altoids "Tiny Box" (of mints), she was surprised at how I carried on about it. Upon seeing the 2-1/4 x 1-3/8 x 1/2" box, I immediately began considering what I might build inside it. PETE MORRIS G1INF started all this! First, read his notes on the 40m conversion. SVERRE HOLM LA3ZA found a way to get more AF output. Some time ago came my son Tomas ok4bx with idea monitoring QRSS signals. I liked that idea and I decided made in my free time, I am in pension, that I will build something related with QRSS. It uses two 12AH7 double triode tubes. They just happened to be available in my junk box. The first two triodes work in a cascode circuit, where the very first one is connected in a Hartley configuration. I absolutely love regenerative detectors. They amaze me to no end. 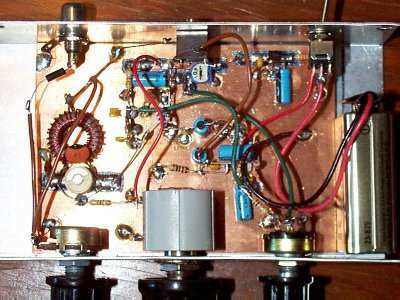 For those of you who don't know the basics: 99% of all commercially-made radios these days are based on the Superheterodyne design. We were studying some simple receivers for the 40m band, as a fact these receivers cover all the HF bands even to 30MHz only changing the local oscillator - VFO / VXO. We built some types, all of them worked, some of them with better results. Base board with the modules built and soldered getting a mechanic fixation and a common and efficient ground too. In the VXO above the 10µH blue Sontag inductor it is the 7.15MHz ceramic resonator. 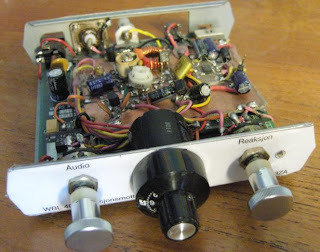 Following the pace of our friend and namesake Onno, PA2OHH, we built a simple receiver (already published here) for the 40 meter band, using the 74HC4066 as mixer and buffer. As there were two surplus gates yet we decided to use one as the VXO with ceramic resonator. After exploring very low power (QRPp) communication by bulding a 40 meter Micronaut CW transmitter, I took on the challenge of constructing a tiny 40 meter companion receiver. I have not had much experience with regenerative receivers, but the WBR is far superior to the others I have built. I was surprised at the WBR's ease of use and the clarity of it's signals. 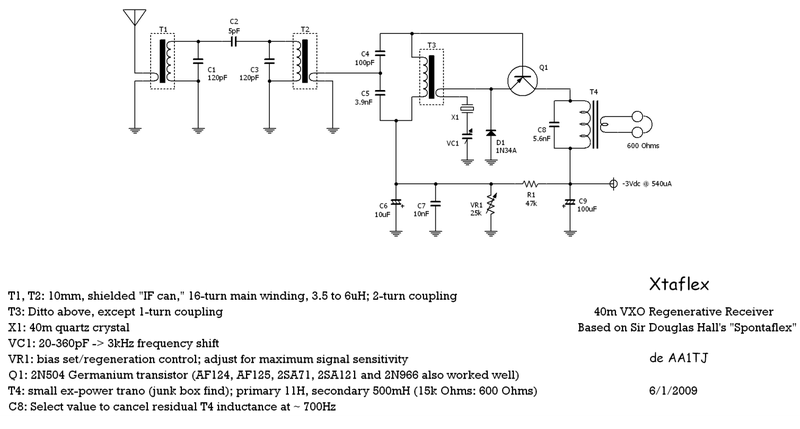 This circuit is based on the Autoflex/Spontaflex receiver designed by Sir Douglas Hall. It turns out that Sir Douglas' clever circuit works well as a one-stage, crystal-controlled (VXO'd) regenerative receiver.